There are many styles and shapes of solar light today. In this article we will look at the best outdoor solar lights for your outdoor space and where they can be used. 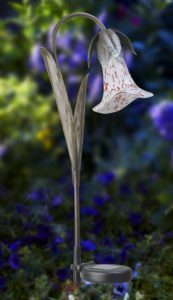 I have several styles in my yard and I will let you know how well they work and what the problems with each type if any. Now lets light up your outdoor space with some examples. A environmentally friendly , powered by the sun light that can be controlled by a sensor to provide safety and security for you outdoor living areas. The photocell controller can operate the system to light at dusk and go off at daylight or be a motion sensor. The solar panel collects power from the sunlight and transfers to the rechargeable batteries. The diode between the two keeps the power going towards the battery. The rechargeable batteries power the lights most of the night, some will go off at daylight. Most of the lights are LED s(light emitting diodes) today. These put out light without a great deal of heat and will outlast your light fixture. Putting several LED s together in one light will make it very bright. Only security lighting still uses halogen bulbs for really bright light. The post type is the most common type of solar light that people use to light up pathways around their outdoor space. I have them around my patio, on top of the post on my deck and my entrance path to my camper at the lake. 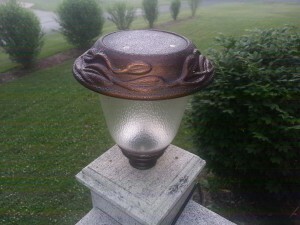 See some examples of post type solar lights here. Around the patio I have them spread out to give enough light to let us sit out and have a drink and socialize in the evening. 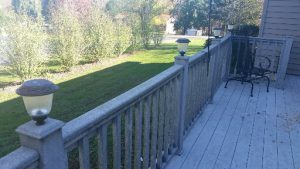 I made them fit the tops of my composite post on my deck. I first measured the size of the post and drilled a hole in the post caps so that it would fit tight. Once installed I had an issue with some of them not working as well as others. See my solution here. The post lights that are at my camper were left by the previous owner in the shed. I just replaced the rechargable batteries and set them in the ground. For my information on how to find the correct repalcement batteries see my post here. 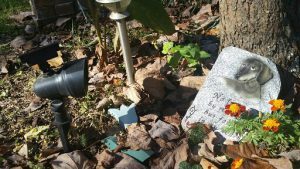 When my pet died, I got a stone for where we buried her. To highlight the stone we purchased a single solar spot light. Once it has been installed, I have only had to sit it back up a couple of times when the kids have knocked it down. I have cleaned the solar panel from time to time to keep the light shinning all night. 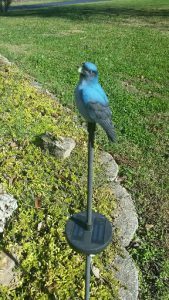 My son wanted a bird solar light in the yard. We purchased this decorative solar light and placed it in the front flower bed so we could see it in the evening when we come home after dark. One thing about this decorative type lighting is that it looks good even in the day light when it is just charging. Every person will have to find out what are the best outdoor solar lights for them. Each home has its own requirements for outdoor lighting and decoration. I have given you a few examples of what kind of solar lighting I have around my home, what kind do you have around your home. Give me a few examples in the comment section below, if you want to send pictures send me an E-mail and I will include it in this article. Thanks for reading, if you have any comments, questions or items you would like covered on this website, use the forms below. Awesome site John. I like your catch phrase “the answer man for outdoor ideas” catchy. There is a wealth of information on that site and I will be visiting again when I have a project I need help with. My favorite is the water features. Those are so awesome, beautiful and relaxing. I have had many water features in my outdoor spaces in the past. Living in the Midwest, the water features are harder to keep up than in the south. I had seven gold fish in my pond in Florida and they were my pets.